Note: SCP-1720 was declared neutralized on 9/8/62. The following information has been kept for historical reference. Special Containment Procedures: SCP-1720 is currently being tracked by multiple ground stations and orbital assets under Foundation control, and any changes in orientation or orbital velocity must be reported immediately. Suppression of knowledge of SCP-1720 is underway with cooperation from the United States National Aeronautics and Space Agency and the various space groups of the Union of Socialist Soviet Republics. Description: SCP-1720 is a lunar orbital probe formerly designated as "Pioneer P-3" and launched by the United States on 11/26/59. Officially, the launch vehicle suffered a malfunction approximately 45 seconds after launch and the payload was subsequently destroyed. All data following this point has been redacted from public records and false files implanted in government files. During the launch of the probe, the vehicle was struck by an object of presumed extraterrestrial origin entering our atmosphere. From captured footage, the object appears to be no more than 11 cm in diameter, dark, irregularly shaped and possibly crystalline in composition. 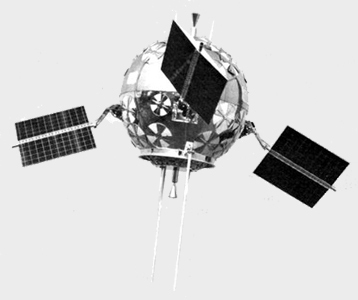 Following the impact and loss of control, the probe managed to reach low Earth orbit despite damage to its primary systems. For several weeks following the launch, sporadic telemetry received by ground stations indicated that SCP-1720 was in an erratic, constantly changing orbit consistent with periodic adjustments made via the probe's on-board propulsion systems. After extensive long-range observation, it was determined that not only was the probe acting independently, it appeared to be using its scientific instruments and on-board camera to perform directed study of surface areas of the Earth as well as other orbiting satellites. SCP-1720 matched velocities with and followed alongside the observing satellite for a distance of approximately 1,200 km despite it being deemed impossible for the original propulsion system of Pioneer P-3 to perform such a precise maneuver. Extensive "growth" was observed originating from an impact hole in the side of SCP-1720. Though the viewing angle did not permit detailed study, this mass was observed to move and "pulsate", suggesting that it may be of organic or biological composition. SCP-1720 circled around and studied the observing satellite before drawing away, behavior consistent with curiosity. As no transmissions have been detected that would suggest that SCP-1720 is being controlled externally, this suggests that it may be a living and possibly sentient entity. On 5/11/61, a directed transmission positively identified as originating from SCP-1720 was detected by U.S. satellite [REDACTED] as the two objects were within 200 km of each other. After several minutes of not receiving any response, SCP-1720 approached and made contact with the satellite before drawing away. The transmission was recorded and is now being analyzed, and telemetry from [REDACTED] is being monitored for signs of unusual activity. On 5/18/61, contact was lost with [REDACTED]. Observation from ground stations has confirmed that [REDACTED] is now autonomous and is moving in tandem with SCP-1720, and has been designated SCP-1720-2. A proposal for reclassification to Keter is being sent up due to SCP-1720's potential for breach of secrecy and further compromise of orbital assets. As of 7/5/61, SCP-1720 has been reclassified as a Keter-level extraterrestrial threat by O5 Council directive. Permission has been granted to attempt to use a prototype anti-satellite missile to disable or de-orbit a SCP-1720 instance for testing purposes. An anti-satellite missile was launched at SCP-1720 on 9/8/61. All four instances of SCP-1720 not only managed to evade the missile but somehow disabled and dismantled the weapon, then proceeded to integrate its components into themselves. Due to the continuing threat to orbital assets, the upcoming United States "Fishbowl" series of high-altitude nuclear tests is being co-opted to deliver a high-yield warhead in an attempt to neutralize the SCP-1720 swarm. On 7/9/62, the US high-altitude nuclear test designated "Starfish Prime" was successfully deployed within 2 km of the center of SCP-1720. Damage assessment is currently underway. Following extensive observation of the fused wreckage, all seven instances of SCP-1720 have been declared neutralized as of 9/8/62. Negotiations with the United States government regarding the unexpected high-intensity electromagnetic pulse and subsequent property damage as a result of the boosted warhead yield is currently under discussion.